Bay area’s finest DJ has gone from turntables to DUNNY?! 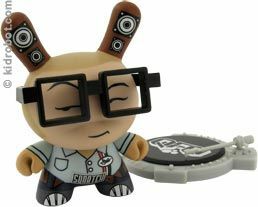 QBert isn’t just killing needles, he is also killing the Dunny series with this exclusive 3-inch figure. Designed by Huck Gee, DJ QBert comes with a mini turntable and enough talent to set any party off and glasses.